The directors of Open Data Kosovo, Dafina Olluri â€™13 (applied arts and science), Blerta Thachi and Blinera Meta â€™13 (applied arts and science), were named to the 2018 Forbes â€˜30 Under 30â€™ list in the field of European law and policy. 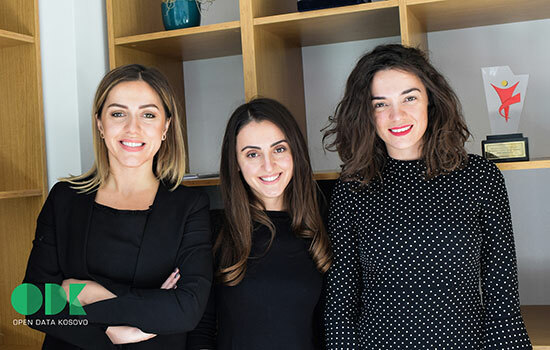 Two RIT Kosovo alumnae are featured in a prestigious 2018 Forbes 30 Under 30 list in the field of European law and policy. Blinera Meta ’13 (applied arts and science) and Dafina Olluri ’13 (applied arts and science) were recognized for their use of technology to improve government transparency and accountability with the nonprofit organization Open Data Kosovo. In addition to advocating for open government data, Olluri said that Open Data Kosovo works to develop the technical abilities of young Kosovars through mentorship and training programs as well as partnering with international organizations to provide expertise in managing civic-tech initiatives. Olluri and Meta joined Open Data Kosovo in 2016. Currently Olluri serves as deputy director, responsible for monitoring project implementation, creating opportunities and partnerships and ensuring that the organization’s end-products satisfy standards of quality. Meta served as executive director before leaving the organization late in 2017 to move to Finland with her family. Since moving, she has joined the board of Open Knowledge Finland, an organization with a kindred spirit to Open Data Kosovo, and is preparing to pursue her MBA. The two alumnae, along with Executive Director Blerta Thachi, were collectively recognized for the accomplishment. To learn more about Open Data Kosovo, go to http://opendatakosovo.org/.